A primary forest, a natural pool and a very romantic place by the sea. What else do you need ? My first time in Temeling was in November 2015. The scooter ride was very impressive because you had to follow a very narrow path, about 50 centimeters wide. And the nearby ravine looked pretty close. The ride remains impressive but at least the path is now wider. And their is a reward at the end of the path ! 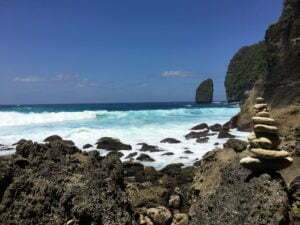 Temeling is one of the highlights of Nusa Penida, still off the beaten track. You will find is the same pack a primary forest, a natural pool and a very romantic place by the sea. Not bad isn’t it ? The road is very good till the entrance of the Temeling site. You will then have the choice between several options. If you came there with your own scooter you can directly ride down the path. It is very steep and a little bit impressive but it is not that difficult. You can also ask a Balinese to drive you down with his own scooter. If I remember well, he will ask you 20.000 IDR. Or you can go walking. It is a beautiful 2 kilometer hike but remember that you will have to come back up. If you came by car, only the last two options are available to you. 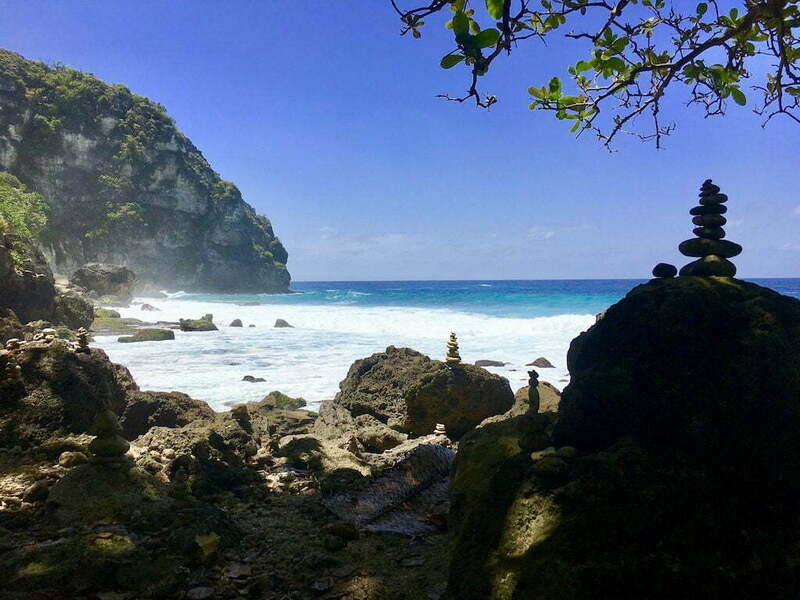 Temeling is one of the places which remains almost untouched by tourism in Nusa Penida. An old-growth forest — also termed primary forest, virgin forest, primeval forest— is a forest that has attained great age without significant disturbance. That’s what you’ll see in Temeling. The path down to the beach runs along a pretty deep ravine. But the trees grew from the bottom of the ravine much higher than the ravine. You are therefore totally surrounded by the forest. I had the bad idea to fly my drone there last February. In less than one minute the drone hit a branch and fell down forty meters below. I went all the way down into the ravine and recovered it. And miracle of the primary forest, it flied again the next day, after changing the propellers. A few scratches on my legs were the price to pay but there is a lot of Aloa Vera in the forest which helps cicatrization. A good tip by the way for any small accident that can occur in Nusa Penida. At the end of the road you will see a small temple which is also a nice point of view. You will then find a recently built (in 2017) staircase. And down the stairs you will see a large natural pool surrounded by the cliff. My friend Mathias, who went there recently, counted 222 steps from the temple to the natural pool. And then 67 steps from the pool to the sea. It was previously a pool reserved for men. The women had their own smaller pool by the sea. In 2017 it was totally filled up with soil. And when I asked what happened I had two different answers. According to some people a natural landslide filled it up . According to others it was voluntarily closed, after a fatal accident of an imprudent diver who dived from the cliff. One of the many facts/legends that you will hear in Nusa Penida ! The first theory seems the right one because the pool was excavated again. But now the pool is not any more reserved for men and seems less sacred than it was. There was even a buoy and some children learning to swim when I was there in February. Continuing the walk you will pass in front of the old women’s pool. And you will arrive at Temeling Beach. It is not advisable to swim there but the view is very beautiful. And you can add up your own pebble to the mounds of pebbles formed over time by all the visitors. 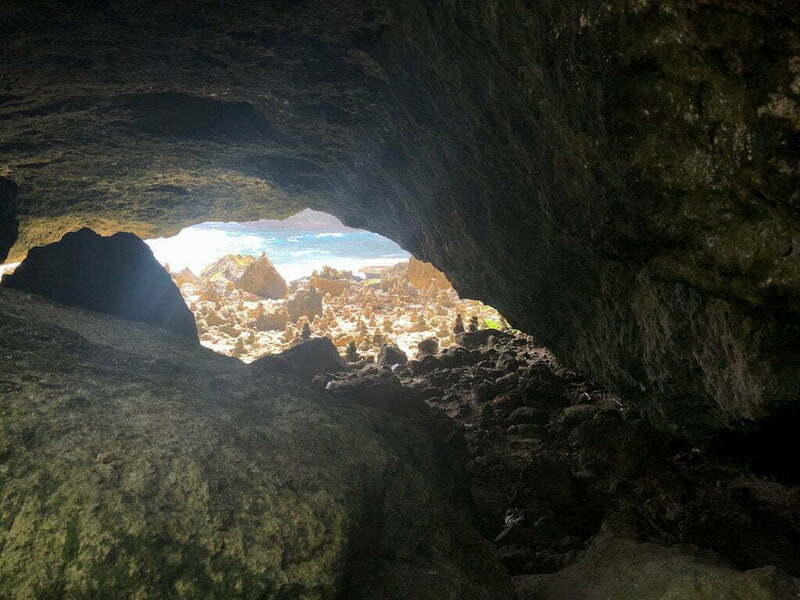 You will also find another beach on the other side of the rock, passing through a cave. It is very beautiful also on the other side. Before arriving at Temeling you will see on the left a sign indicating Manta Point. On your way to, or back from, Temeling, it is worth it to make this little detour. After 5 minutes you will arrive to a temple. And behind this temple you will find a beautiful view from the cliff. It is called Manta Point because the Manta rays come, almost every day of the year, to be cleaned of their parasites. It is one of the best know dive site of Nusa Penida. 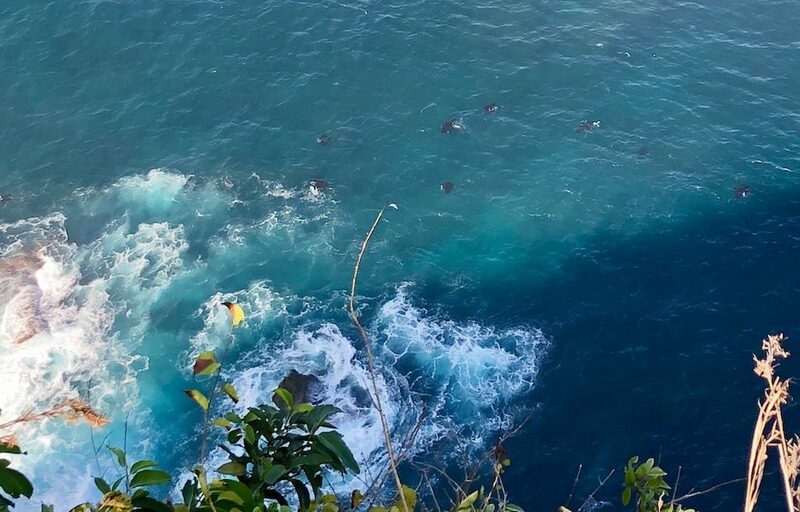 If you are lucky you will see Manta rays from the cliff. But the best way to see them is still to come and dive at Manta Point. For example with Warnakali diving center.